International Cricket council has announced the prize money pool for ICC Champions Trophy 2017 where $4.6 million will be distributed among all 8 teams according to how they finish. The winners of Champions Trophy will take on $2.2 million while the runners-up will earn $1.1 million. Below is the entire breakdown of 2017 ICC Champions Trophy prize money pool. 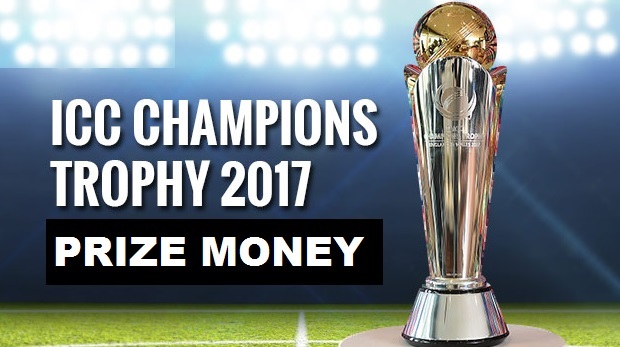 ICC Champions Trophy Prize Money Pool: ICC has confirmed the prize money for champions trophy 2017 and it sees increase of around half a million compared to 2013 event. Every teams is guaranteed $60,000 for participation. While teams finished third in the group stage will get $90,000. Teams losing in semifinal will earn around $450,000 each. Losing finalists will get $1.1 million and the eventual winners will take home $2.2 million for winning the trophy. With the prize money increase ICC Champions Trophy 2017 becomes the second highest paying international tournament only behind ICC Cricket World Cup where around $10 million was awarded in prize money pool in 2015 and eventual winners Australia got $3.97 million for winning the tournament. ICC Twenty20 world also have $10 million prize money pool but winners only take on around $1.6 million. Who gets the prize money ? Cricket boards or Players ? Prize money is awarded to relevant cricket broards while players only get performance prizes like (man of the match or players of the series etc) from ICC. Once cricket board has the prize money its upto them if they award any portion of prize money among their squad. For example if England win’s 2017 ICC Champions Trophy, ECB will get $2.2 million from ICC but ECB have promised to share 100% of the prize money to be split equally among 15-man squad. That means England players will get around $120,000 each. Australian & Indian cricket board also have similar arrangements. While other cricket boards like Pakistan and Sri Lanka has promised 100% increase in players’regular match fee for winning the tournament. it is not enough to all team. Kholi getting out twice helps Pakistan win World Cup. The best unforgettable moment of the whole tournament was Dhoni holding Sarfarz baby. I have always been an admirer of Dhoni and this show of affection for an Indian player for the child of a Pakistani player has increased by respect for Dhoni. Sports should bring people together rather than divide them. I hope there are more such pictures posted to promote love and harmony between India and Pakistan. How much prize money for man of the match, man of the series and gold ball?